Liverpool, U.K. duo Her’s stopped by the Paste Studio in New York City this week to perform tracks from their debut album, Invitation To Her’s. Earlier this year, Paste featured Her’s on our list of 15 Liverpool Bands You Need to Know in 2018. Their debut album is a sparkling amalgamation of exuberant jangle-pop, loose slacker rock and funky New Wave and at every corner, listeners are met with their zany personality and their charming celebration of past and present influences. In this session, the band played three tracks from their new record—”She Needs Him,” “What Once Was” and “Under Wraps.” Equipped with a drum machine instead of a drummer, lead singer and guitarist Stephen Fitzpatrick’s low vocal drawl evokes Julian Casablancas and his higher pop pipes call to mind Wild Nothing, while bassist Audun Laading’s swift moves and bouncing basslines bring a retro flare and jovial spirit. The band are currently on their first American tour, stopping in Chicago, Los Angeles and San Francisco. They’ll be making an appearance at next year’s SXSW festival along with a soon-to-be-announced more extensive U.S. tour slate. 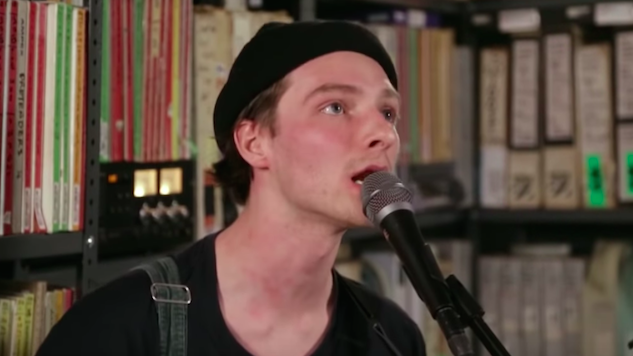 Watch their full performance from the Paste Studio below. You can stream or buy their debut album, Invitation to Her’s here.